You will need a pen (not thick tip), paper, measuring tape and a hard surface. Have someone trace your foot while you stand up if possible, as this while give you a more accurate shape. 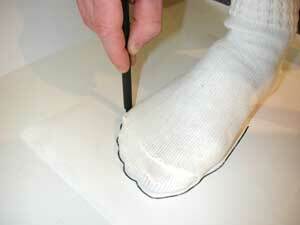 Keep the pen vertical at all times when tracing your foot. The aim is not to draw around the part of the foot, which touches the paper, but to convey the accurate size of your foot. Draw around your foot with the socks you plan on dancing in. Do not draw between your toes. 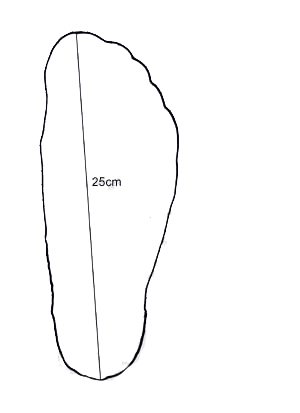 Draw a line from the tip of the big toe to the heel and measure it. Do this for both feet. Use the smaller foot measurement for Ghillies as you want them to have a close fit. Use the larger foot measurement for Jig Shoes. Please note as this method is a good way of assessing the correct size, there is no 100% guarantee that this method will deliver the correct size. There are a variety of reasons while this might be the case, such as the height of the dancers arch, or human error when measuring. We cannot accept liability in the event where this sizing method is used and the size is incorrect and therefore will not be responsible for exchange or return postage, unless the item was sent in error.